Our team at Simple Car prides themselves on offering our customers with the very best car-buying experience possible. We do this by offering our customers with excellent financing deals that allow customers to make affordable payments for quality used vehicles. Additionally, we offer automotive servicing for our customers to keep their pre-owned vehicle running for as long as possible. 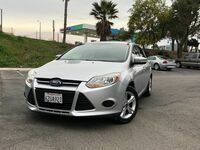 Let’s take a look at the best aspects of used Ford Focus models! If you are interested in learning more about the pre-owned Ford Focus models that we have available, then you should contact the staff at Simple Car today! Our team is happy to answer any questions that you may have about our used vehicle inventory. Visit our dealership in Escondido, CA today!